Michael Africa Jr., left, with his father, Michael Sr., after leaving Phoenix state prison. By the time Michael Africa Sr. stepped into the crisp October air outside State Correctional Institution Phoenix, he had not seen his wife, Debbie, for close to 40 years. Both were members of MOVE, the radical back-to-nature group, during a 1978 standoff at its Powelton Village compound when Philadelphia Police Officer James J. Ramp was killed and 18 police and firefighters were injured. The Africas, along with seven others, were convicted of third-degree murder and in 1980 received 30- to 100-year prison sentences. Two of the MOVE 9 died in prison; until this year, none had been granted parole. 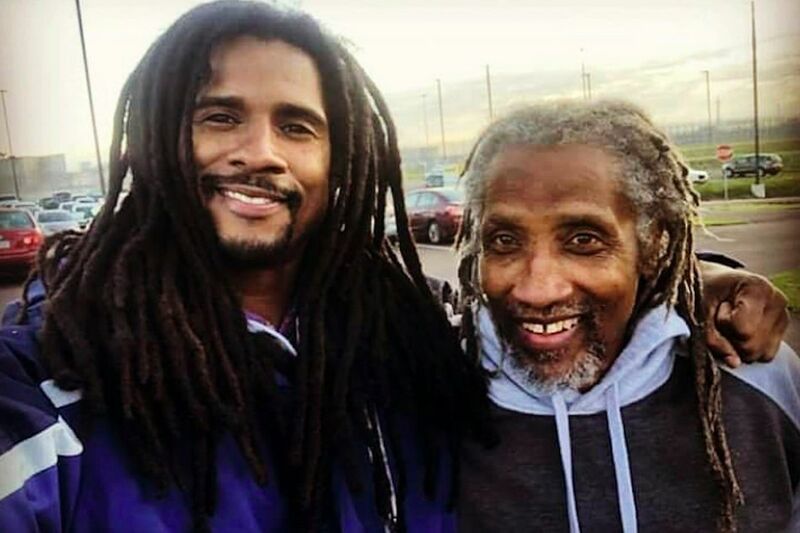 Africa, incarcerated at age 23, is a great-grandfather now. He and Debbie, who was paroled in June, are staying with their son, Michael Jr., who was born in a Philadelphia jail cell 40 years ago, and whom Africa had never seen outside prison visiting rooms. The couple had kept in touch through letters until they finally saw each other again Tuesday. "What I'm looking forward to, I've already got," he said hours after returning home, "and that's hugs from my family, seeing my family again without restriction. That's what I was looking forward to the whole time I was there." Africa had been denied parole nine times before he received help from activist lawyers Brad Thomson and Bret Grote on his most recent go-round. Thomson, of the Chicago-based People's Law Office, said Africa and other MOVE 9 members already were recommended for parole by the Department of Corrections, but that he compiled their prison records and sought out references, including a number of retired prison guards. "One guard said he had a spare room, and he would open up his home to Mike if needed, because of how much he trusted and respected him," Thomson said. Attorney Brad Thomson, Debbie Africa, her granddaughter Alia Africa, and her son Mike Africa speak to the media during her first public appearance at the Faith Immanuel Lutheran Church, in East Lansdowne in June. The first MOVE member was granted parole after 38 years in prison. Thomson said all the former MOVE members he's working with have strong recommendations from the prison system. Yet at the same time Debbie Africa was granted parole, two other women, Janet and Janine Africa, were denied. Their legal team has filed federal petitions challenging the parole board's decision. The enduring memory of MOVE has become the police firebombing of its Osage Avenue compound in 1985 that killed 11 members, including five children, and destroyed 65 houses. But seven years earlier, in 1978, MOVE members who were heavily armed ended up in a 56-day siege that pitted the residents of the compound against Mayor Frank L. Rizzo, who promised to "show them more firepower than they've ever seen." Today, Michael Africa says he wants to live quietly, and to find work so that he and his wife can get a place of their own. "We don't want to be a burden to anyone," he said. What happened back then "was an ordeal. It's something we don't want repeated, for us or anyone else. We don't want anyone harmed or hurt in any kind of dispute. We would always have rather talked out any differences. At this point, we don't want any differences. All we want to do is live our life, help people if we can."